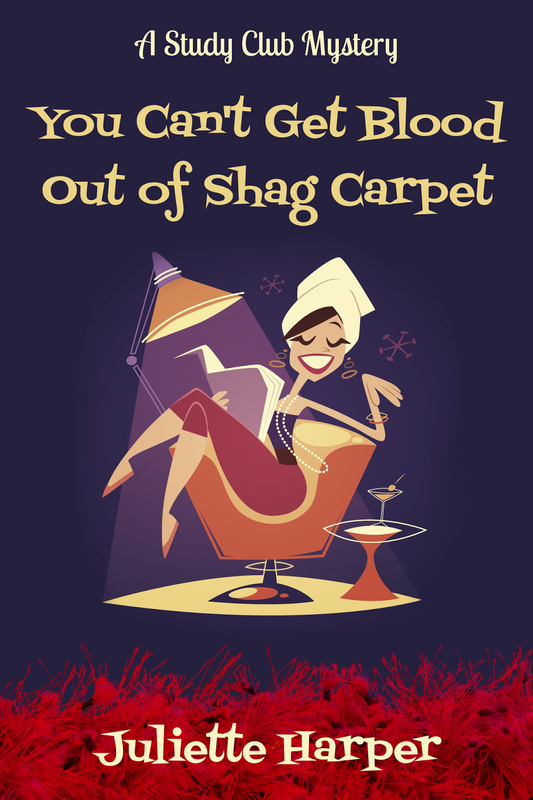 Welcome to the blog tour of You Can’t Get Blood Out of Shag Carpet by Juliette Harper! This is the first book in A Study Club Mystery series and it’s now available for sale on Amazon and Smashwords for only .99 cents! This tour runs June 15-26 with reviews, interviews, guest posts and excerpts. Check out the tour page for the full schedule. No one is quite sure what the ladies in the Study Club study, but I’ll tell you one thing: I sure want to be a member of the club. You Can’t Get Blood Out of Shag Carpet is the hilarious first book in Juliette Harper’s Study Club Mystery series and I am absolutely hooked. Set in a small Texas town in the 1960’s, the town gossip is all about Hilton Milton, who was found stabbed to death in his home–on his wife Wanda Jean’s brand new shag carpet to be exact. Study Club leader Clara Wyler is as concerned about the state of that shag carpet as she is about proving Wanda Jean’s innocence. She enlists the help of the other Study Club members and soon the ladies have launched an investigation into the murder of Hilton, as well as the death of Wanda Jean’s brother-in-law months before. I really, really enjoyed this book. The ladies of the Study Club had me in stitches. Each character is painted with a unique brush and filled in with terrific detail. The canvas on which these characters play is vividly inviting and delightfully memorable. I can’t wait for more adventures with these characters, this series, and this author. Juliette Harper is the pen name used by the writing team of Patricia Pauletti and Rana K. Williamson. You Can’t Get Blood Out of Shag Carpet is the first installment of Harper’s debut cozy Study Club Mysteries, an hilariously funny look at the often absurd eccentricities of small town life. The second book, to be released in coming months, is called You Can’t Put a Corpse in a Parade.The droll series, set in the 1960s, is a light-hearted spinoff of Harper’s Lockwood Legacy a nine-book chronicle of the lives of three sisters who inherit a ranch in Central Texas following their father’s suicide. Three of the novels are currently available: Langston’s Daughters, Baxter’s Draw, and Alice’s Portrait. The fourth book, Mandy’s Father, will appear in Summer 2015. Thanks for introducing me to Juliette Harper and her various books she has penned. I am also happy to be able to enter for the giveaway. Your blog provides me with a great insight into new books.